Owners of this model say they can fit between eight and ten guns comfortably on one side of the unit. With 8 – 10 guns alone hitting upwards of $5000, it’s inevitable that you spend good money on a gun safe to ensure your belongings stay safe. There are patented stand-offs in this unit allowing you to get maximum storage with your rifles while keeping the space neat. Stack-On takes great pride in their locking mechanisms on their gun safes. The Stack-On E-24-MB-E-S follows suit with Stack-On’s belief. You can be sure the contents of your safe will be well-protected. This model comes with three, 1 ½ inch, live action locking bolts down the exterior side of the door. As well as one on the top and bottom of the door. It also has three stationary steel bolts on the hinge side of the door. You can get this model with a three-number combination dial or an electronic keypad with backup keys. The locking systems are programmable offering you the convenience of creating combinations that will be easy for you to remember. The gun safe is fire resistant and has been tested at 1400 degrees. The door has flame resisting filling inside of it. The door stripping along the inside of the safe is designed to expand in heat. Adding an extra level of protection to the contents of your safe. Weighing in at 400 pounds (empty), you can rest easy knowing that should you experience home invasion, this unit will not be moved with ease. Owners of the Stack-On E-24-MB-E-S have little to be displeased with. Some have found the stand-offs don’t house their carbines well. They have remedied this situation by using one of the shelves to raise the height of the rifles for a better fit. While most enjoy the additional storage unit on the door, some have found that loading it causes the safe to lean forward. In combination with a depth that is shallow compared to other models, some have found there is a higher need to secure the unit firmly in place before loading. This model does come with two pre-drilled holes in the bottom of the safe – the holes have passed fire testing – along with the bolts required to secure your safe in place. 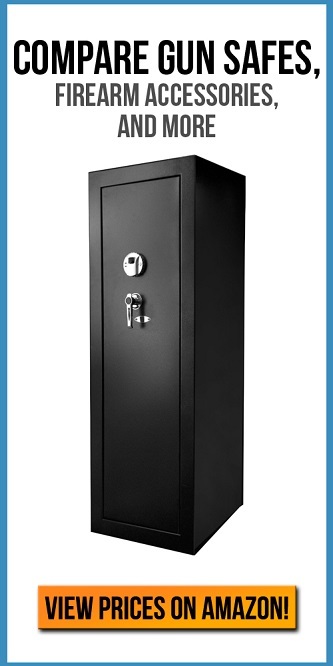 For those looking to keep firearms and valuables protected using a medium-sized safe, this is a great purchase. This unit protects your belongings, and your bank account. With high security features at an affordable cost. Also, Stack-On products come with a limited lifetime and five year warranty for added peace of mind. If you purchase off of Amazon, you will also receive free shipping.